Please Note – Match day tickets required for entry to curtain raiser. Tickets for all Gold Coast SUNS home games at Metricon Stadium can be purchased through Ticketek. Alternatively, you can purchase in person at any Ticketek Agency, click here for locations or via phone on 132 849. Get the crew together to experience a new level of cor-pirate hospitality for 2019. The Pirate Life Deck allows you to experience AFL in true GC style from your Level 3 premium reserved seat. For only $59 get your ticket to the exclusive Front Bar area with icy cold Carlton Draught on tap. Your ticket includes event entry with exclusive access into the Carlton Front Bar area, and your first drink FREE! (18+ Only Area). Make sure you arrive early to collect your free SUNS Clapper from Gate 1, 3 & 5. Available for the first 5,000 through the gates! 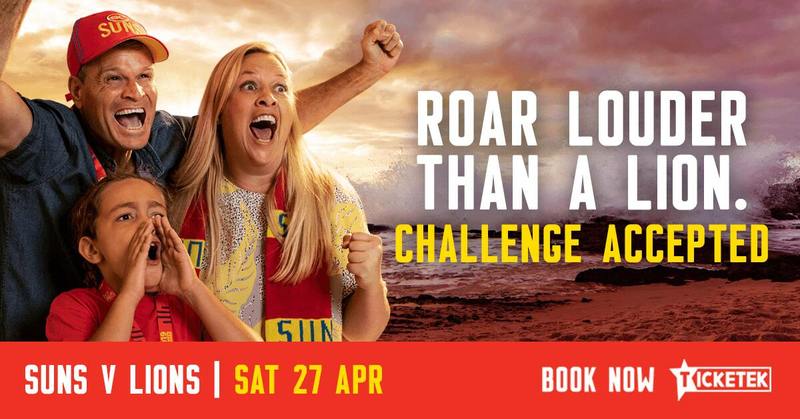 - SUNS Mascots Sunny Ray and Skye, will be roaming around, so you grab a photo with them and share it on social media using #ChallengeAccepted. New in 2019, make sure you check out the SUNS Squad! Thanks to Ikin Dance we'll have our very own dance crew at selected home matches this season. The SUNS Surf Club is a new General Admission seating area at Metricon Stadium. Complete with a life-sized lifeguard tower the SUNS Surf Club is the perfect place to sit back and take in the footy. Stick around after the game to get on the ground with Macca’s Kick 2 Kick. Make sure you grab your SUNS gear from the SUNS Shop located inside Gate 3 or from the various outlets around the stadium. All ticket holders can redeem a FREE Big Mac at any Gold Coast McDonald’s restaurant the day after the match if the GC Suns score 10 goals or more – win or lose! Make sure you visit the Metricon Deck inside Gate 1 for free face painting by our wonderful stadium partner Metricon! Get your SUNS Colours painted on before you take your sit to cheer on the team! SUNS fans make sure you grab your Metricon Banners from the Metricon Deck on your way in for your chance to take home some cold hard cash! It’s also the perfect way to celebrate a goal so make sure you bring back your Metricon Banners to all SUNS home games we want to see them here every week to make sure this stadium is a sea of red every game and after every SUNS goal. Make sure you visit the Austworld Photo Wall and strike your best surfing pose alongside your favourite GC SUNS Players! Post your photo on Ausworld’s Facebook page for the chance to win prizes! Don’t forget to hashtag #CHALLENGEACCEPTED. Gold Coast SUNS Members we're on the lookout for a passionate member in the stadium. Whoever that lucky member might be, will get the chance head out on field after the game, meet a Gold Coast SUNS player and take home the official Huawei match ball from Sunday’s game. Visit our Match Day Raffle Ticket Sellers and purchase a ticket to go in the draw to win a Corporate Hospitality Suite for eighteen guests at Round 8 v Melbourne match on Saturday, 11 May 2019, valued at over $5,000. Tickets are just $10 and all funds raised goes to the Clubs Talent Academy & Community Programs. Prize drawn RD 4. Present your ticket on Surfside Buses, QLD Rail services and the G:Link. Shuttle buses from Nerang Station, Broadbeach South Station Event bus stop and park & ride facility at Boowaggan Rd, Merrimac. For more detail around transport to and from Metricon Stadium, click here. All 2019 Match Access Memberships including AFL Gold Coast & Auskick Junior memberships will provide access to this Sunday’s home game against Carlton at Metricon Stadium. Match access members just need to scan their membership card at the gate and head to the designated seating areas relevant to your membership category. General admission members, don’t forget you have access to member exclusive GA seating on Level 2 in Aisle 201, just show your GA membership card to gain entry. All general admission members wishing to upgrade to a reserved seat at an additional cost or other GC SUNS members and fans wishing to purchase tickets can do so through Ticketek, Visit Ticketek. General Admission members wishing to upgrade to a reserved seat will need to enter their 12 digit barcode number on your membership card. The Gold Coast SUNS membership team will have membership’s available to purchase from our membership trailer/marquee located outside of Gates 1 and 3 from 11.45am until the start of the game. The Gold Coast SUNS membership team will be available for all enquires at our Member Services Windows located at Gates 1 or 3 from 1.45pm until the end of the 1st quarter. If you have a membership enquiry after entering Metricon Stadium, the membership team are also available at the Metricon Home Hub from 11.45am until the end of the 3rd quarter. Members who are eligible to access our Member’s Light Tower Bar at Metricon Stadium will need their 2019 membership card to gain entry. Please note – 3 Game General Admission, 6 Game General Admission, 3 Game Reserved Seat, SUNS Supporter, AFL Gold Coast Junior and Auskick Junior Memberships do not provide access to this exclusive area. - Eligible members must present their 2019 membership card upon entry and have it visible at all times. If you do not have your membership card please visit the Membership Services Team at Gates 1, 3 prior to entering the stadium or visit Metricon Home Hub inside for a temporary pass. - The Light Tower Bar has a limited capacity. Entry won’t be permitted once capacity has been reached. - Patrons under the age of 18, need to be accompanied by an Adult.